It’s that time of year, so Early Irish Cinema takes a trip to the theatre to experience an Irish Christmas pantomime. Frank Leah’s caricature of Assistant Provost Marshal Captain William Woods, Evening Telegraph 12 Jan. 1918: 5. Frank Leah’s caricature of playwright Thomas Nally, Evening Telegraph 29 Dec. 1917: 4. 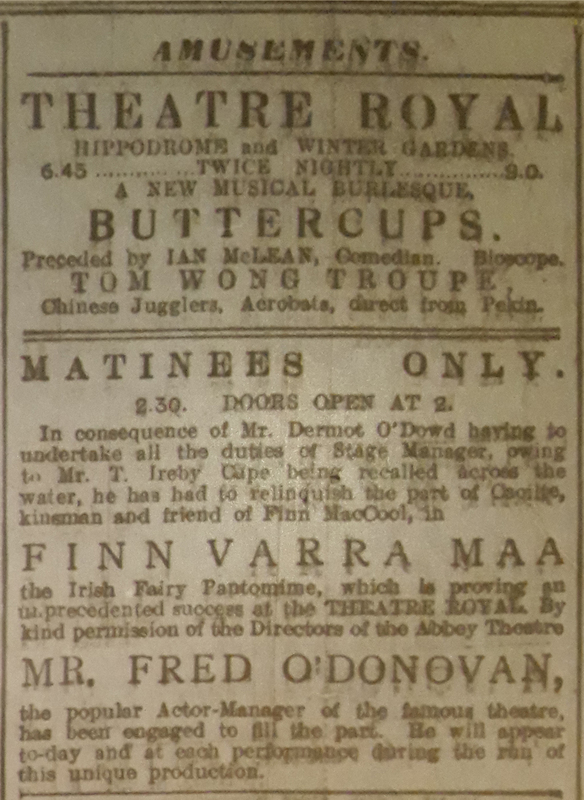 Dublin theatregoers then as now were well used to the Christmas pantomime season. At this time, the stages of the city’s theatres and halls would be dominated by large casts singing and dancing, elaborate sets and costumes, and scripts based on folktales, often with a fantastical element, but also containing comic interludes referring to events of the day. In 1917-18, the professional theatres offered Cinderella (Gaiety), Little Boy Blue (Empire) and Little Jack Horner (Queen’s). At the city’s other multi-use halls, productions were even more numerous, with companies presenting Aladdin’s Wonderful Lamp at the Father Mathew Hall, Red Riding Hood at the CYMS Hall, Robinson Crusoe at the Pioneer Hall and Mother Hubbard at St. Teresa’s Hall. Mildred Telford played the part of the girl Befind MacHugh in Finn Varra Maa; Evening Telegraph 5 Jan. 1918: 4. Finn Varra Maa differ from all these in one crucial respect: it was – or claimed to be – the first wholly Irish pantomime. “Written by a Dublin man [Thomas Nally], with music by a Irish composer [Geoffrey Molyneaux-Palmer] and presented by a company all Dublin from the tiniest tot who romps in Kyle-na-Sheeogue [Wood of the Fairies] to the mature artistes who rule in royal grandeur in Fairyland,” enthused the Irish Independent’s theatre critic Jacques, “this beautiful play marks the high-water mark of native artistic endeavour in the music and dramatic revival in Ireland” (“Beautiful Fairy Play”). It was loosely based on the legends of Finn McCool, played by Breffni O’Rourke, recently seen on screen in the Film Company of Ireland’s Rafferty’s Rise (Ireland: FCOI, 1917). O’Rourke led Finn Varra Maa’s large cast that included 100 children. Its title referred to Finn as “the old Irish equivalent of ‘Santa Claus’ – long before that gentleman was heard of in this country” (“Finn Varra Maa” 22 Dec.). The fairy world was connected to the human world through a storyline in which the young girl Befind MacHugh (Mildred Telford) was abducted by the fairies, and 12-year-old Padhar Bawn (Gerald Rock) decides to rescue her. Frank Leah’s caricature of Finn Varra Maa producer T. Ireby Cape, Evening Telegraph 3 Jan. 1918: 4.
but, in view of his many virtues, was according to ‘Tradition,” as represented on the stage merely condemned to an indefinite period of existence in fairyland. The play shows him as King of Fairyland warring with Aobhill, the deposed Fairy Queen who typifies the spirit of Evil. Ad announcing that Fred O’Donovan was replacing Dermot O’Dowd in Finn Varra Maa’s key role of Caoilte; Dublin Evening Mail 2 Jan. 1918: 2. “A Dublin Priest” reviewing the opening day pointed out that this battle between good and evil was Christianized by the fact that Finn was not the play’s only – or even main – heroic characters. He was rescued from Fairyland by his kinsman, the Christian knight Caoilte MacRonain, played by Dermott O’Dowd. When Ireby Cape was recalled to London and O’Dowd had to focus on stage managing Finn Varra Maa, Abbey Theatre manager Fred O’Donovan replaced him on stage in the role of Caoilte. These development coincided with – but seem to have been unconnected to – William Woods’s attempts to censor the play. Ad announcing the censoring of Finn Varra Maa following Woods’s intervention; Freeman’s Journal 10 Jan. 1918: 2. The producers appear to have negotiated potential difficulties with the legendary elements of the play successfully at Christmas, but William Woods was more concerned with the depiction of current events. In particular he targeted what several papers called the “low comedy” provided by a country policeman (Bryan Herbert) and the bailiff Sheumas Pat (J.P. MacCormac). Although issues of class and respectability were bound up in the phrase, the use of the word “low” was meant not as a value judgement but descriptively, contrasting this kind of laugh-out-loud knockabout comedy with, for instance, the “quaintly humorous” songs of O’Carroll Reynolds (“Dublin Priest”). In the wake of the controversy, newspapers published the censored lines. Freeman’s Journal 11 Jan. 1918: 4. The Finn Varra Maa lines that Woods found offensive concerned the conscription of the play’s RIC constable into the British Army to fight in France. “You’re in the Force, God help you Keogh,” Bailiff Sheumas Pat tell him, “And you’ll be bound some day to go. / They want to let the Germans see / Our sable-belted R.I.C.” When Constable Keogh protests his dislike of killing, Sheumas Pat replies: “’Twould be a dreadful sight to see, / ’Tis riddled like a sieve you’ll be, / Just lying in a heap out there, / Without a mother’s son to care.” On the 9 January, the actors playing Keogh and Sheumas Pat avoided the Assistant Provost Marshal’s wrath by substituted for this speech lines that began with Keogh warning Sheumas Pat: “Stop! Not a word about the war.” Sheumas Pat replies: “Now, what on earth am I to say? / The Censor’s cut my lines to-day.” Keogh answers: “The Provost Marshal says, ‘Curtail! / Your next four speeches, or in jail / You’ll soon be lodged, on my advice.’” Sheumas Pat inquires in conclusion: “Is this the work of Major Price?” (“Censoring the Fairies”). A day after the censorship was announced, it was withdrawn; Evening Herald 11 Jan. 1918: 2. Overall, this was a minor incident that probably served more than anything else to generate publicity for the pantomime as it entered its last week of production. But it was an early indication from the field of popular culture about thr direction from which Irish public resistance to conscription would come. “Beautiful Fairy Play.” Irish Independent 27 Dec.1917: 2. “Censoring the Fairies: Funny Men’s Quaint Substitute for Deleted Lines.” Freeman’s Journal 10 Jan. 1918: 2. “Christmas Week Amusements: Cead Mile Failte for Irish Pantomime.” Evening Telegraph 27 Dec. 1917: 3. A Dublin Priest. “Finn Varra Maa: First Performances.” Freeman’s Journal 27 Dec. 1917: 6. “Finn Varra Maa: Irish Fairy Pantomime at the Theatre Royal.” Freeman’s Journal 22 Dec. 1917: 7. “Finn Varra Maa: Censorship Denied by Authorities: Funny State in Fairyland.” Evening Herald 10 Jan. 1918: 2. “Finn Varra Maa; The Censor, the Provost-Marshal and the Fairies.” Freeman’s Journal 11 Jan. 1918: 4. “Records of Irish Police Forces in the War.” Irish Times 8 Dec. 1917: 8. “To-Day & Yesterday: The Lines Restored.” Irish Independent 12 Jan. 1918: 4.